Tyrolsport Brake Caliper stiffening kit for 2002-2006 MINI Cooper and MINI Cooper S and 2005-2007 MINI Cooper and Cooper S Convertible. 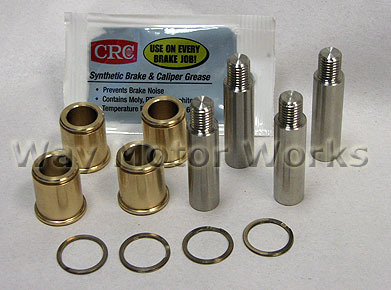 This simple but effective kit is a huge bang for the buck mod for the brakes on any MINI. The Tyrolsport bushings replace the stock rubber bushings on the brake calibers. And now you ask what these do for you? Well those stock rubber bushings will give under hard braking, and flex. That flex causes uneven pad wear and rotor deposits. This simple cost effective tyrolsport brake caliber stiffening kit will improve brake feel and performance. 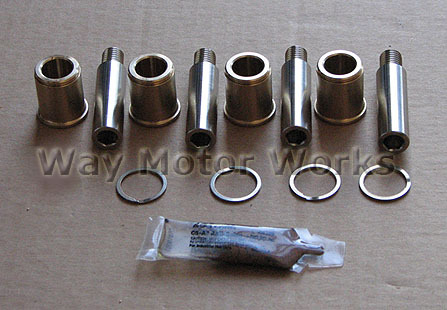 Enough for 2 brake calibers to install on the Rear of your MINI.